Any invasive pest that finds its way into Florida will not only survive, but will most likely thrive in our state’s temperate climate. Additionally, invasive pests, some of which enter the state through Florida’s numerous international air or marine ports, have the potential to devastate Florida’s $108 billion agriculture industry. Preventing these invasive pests outside from crossing our borders is the most effective way to protect our state from threats. In partnership with the U.S. Department of Agriculture and the U.S. Department of Homeland Security, the Florida Department of Agriculture and Consumer Services developed a public awareness campaign in 2011 to educate travelers about the threat of invasive species. “Don’t Pack a Pest” is a collaborative campaign that urges travelers to help prevent the introduction of pests and disease by declaring agricultural items for inspection. 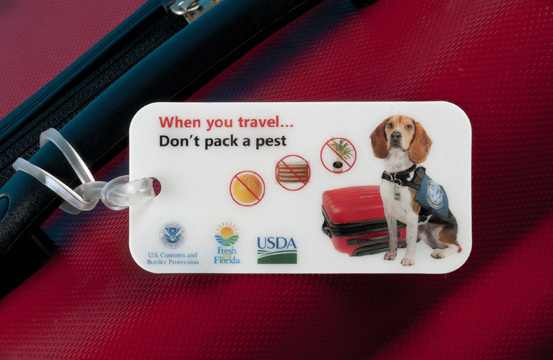 Billboard and video advertisements featuring the “Don’t Pack a Pest” message can be seen in 20 of the busiest airports across the United States, including Miami, Orlando, Houston, Atlanta, and San Francisco. More recently, the campaign has expanded to international airports like Puerto Rico, Jamaica, the U.S. Virgin Islands and, as of this month, the Dominican Republic. A survey of more than 400 travelers in Miami International Airport revealed awareness of declaring agricultural products was up from 37 percent in 2012 to 60 percent in 2013, a more than 60 percent increase. And as a result of greater awareness through the “Don’t Pack a Pest” campaign, travelers can help us protect Florida’s 300 commodities and $108 billion agriculture industry from threats like invasive pests and disease.